Inspired by client feedback, the A Group has introduced a new 85 metre yacht concept called A470 that completely revolutionises the typical superyacht layout. The A470 concept seeks to solve a problem seen on many of the largest superyachts in which certain spaces are duplicated – such as multiple saloons and dining areas – and therefore rarely used. 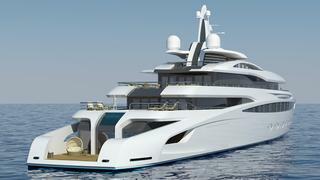 According to the A Group, the idea for the A470 concept came from clients who pointed out that superyacht layouts are often overly complex and repetitive, with too many spaces that aren’t put too good use. The A Group instead presents a design with a “rationalised interior arrangement”. The A470 yacht concept’s original exterior and interior layout will offer, for instance, only one dining area and one saloon, but with huge volumes in each space and massive ceiling heights. The A Group told Boat International, "The saloon is 140 square metres with a ceiling height of nearly 3 metres." The dining area will be an "indoor outdoor dining experience" that allows the owner and his guests to dine al fresco no matter the weather, protected by a glass enclosure in case of wind or bad weather. "This area is fully protected and A/C supplied," the A Group adds. Likewise, the owners’ suite and guest cabins on board the A470 superyacht will be spacious, there would be a large indoor cinema and a welcoming gym and spa area. The outdoor spaces will also benefit from this novel approach to layout design with huge spaces to unwind on the sun deck with a pool, Jacuzzi and bar, or at the large beach terrace aft. The superyacht's beach club stretches out over 107 square metres and hosts a hammam, sauna, gym, massage room, bar and day head, and it opens onto a 75 square metre terrace on the sea. Spread out over five decks, the A470 concept has a low profile and sleek lines, with design cues that are part of the A Group’s signature, such as the “shark glass fin" motif. "We have always been inspired by glass and how complex it is to work with. But once you succeed, the result is astonishing! This is why we have chosen to use this material to 'sign' our projects," explains Carole Fournon of A Group. "We call 'shark glass fin' the huge pieces of glass we have at the top of our superstructure. These panels seem to be floating in the air, as their way of fixing is discreet. Furthermore, each piece of glass is of a different size, to perfectly follow the curve of the superstructure. This feature is a design trademark for all The A group designs, as seen in our latest 101 metre delivered in July 2015 by Kusch yachts." 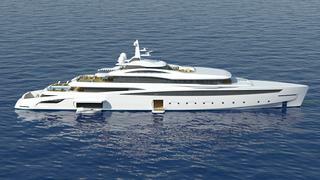 The A Group has penned the exterior lines and designed the interior for the 135 metre Fincantieri superyacht Project Atom, which is currently for sale.